How do we know that short stories do better online? Continue reading How do we know that short stories do better online? Writing style needs to change to take advantage of the hyperlink. That’s the message I want to inject into the discussion about whether deep, long-form writing can survive online — especially long-form journalism. Many people assert that articles need to be shorter online than they are in print, and Nic Carr even famously argues that the internet is making us stupid by destroying our attention span. But I don’t think the web is shallow at all. I think it’s the deepest medium ever invented, with incredible potential for telling complex, irreducible stories — or at least it can be, if you don’t treat it like print. The yellow bits are the unique information that can only be found on that page. The other bits of writing are there to provide the context needed to make sense of the whole , or to get the reader up to speed if they don’t know the backstory. In print, this is absolutely necessary, because a print story is a self-contained object. There is no where else the reader can go to look up an unfamiliar term, to check out a sub-plot, or to investigate the history. That is why we have context paragraphs. That is why we have little definitions of terms that might be unfamiliar to some, and explanations of who a source is and why we should believe them. Online is different. We can move the context, verification, and background out of the main story, paring the piece down to a thing of streamlined beauty — but all the depth is still there, via links, for anyone who wants it. When I try to understand how the internet changes communication, one of the points I keep coming back to is the personal nature of online media: it’s now possible to present a different experience to every single reader (user? viewer?) 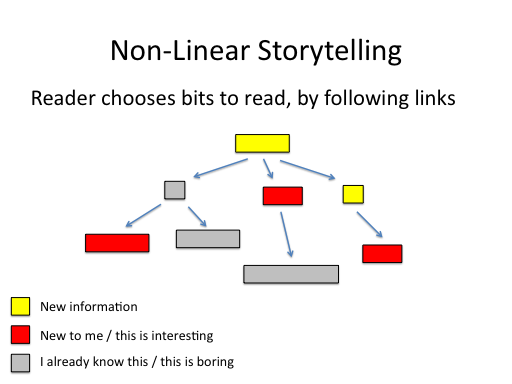 Choosing whether or not to follow a link is a simple way for a reader to tailor the presentation to what they already know, and to indulge their own curiosity. And links let you skip the boring bits. We’re used thinking of “an article” as a self-contained unit of story. It’s not. 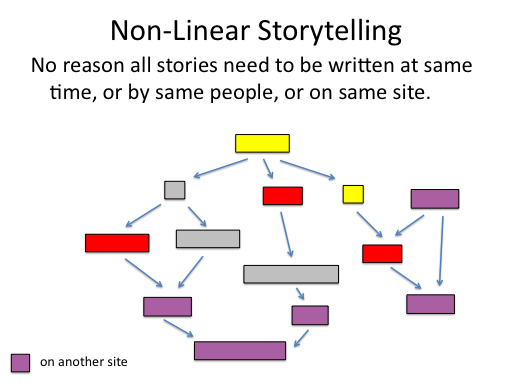 The component parts of a story might even be written at different times, published on different sites, or created by different authors. And now our diagram looks like the web actually looks, lots of pages from different people about different aspects of a very complex world. That is the medium we write in, not some simulation of a stack of paper, no matter what your word processor shows you. Of course, the web also allows fully interactive stories, but it’s often forgotten that hypertext itself is an interactive medium — or it can be, when we put the right links in the right places. 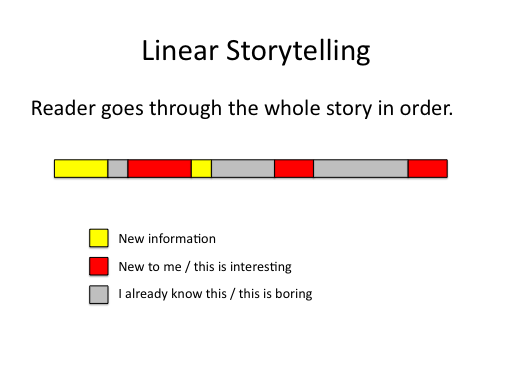 People have been experimenting with non-linear stories for decades, but given that a generation or two has now grown up with hypertext, it’s probably time to let our storytelling style grow up too. Online, short doesn’t necessarily mean shallow. We’re just measuring “depth” wrong when we only look at a single article. That’s not how people actually consume the web, and we shouldn’t force them to.